Getting a new roof installation on your home can be a stressful time. It seems like you’ll be out of your home for ages but actually here at Livingston Roof Pros we can install a new roof quickly. We’ll have your home back to normal as soon as possible while still doing a good job on your roofing project. In this article I’ll discuss some of the time frames that you’ll face when getting a new roof installed and things that may lengthen the process as well. There’s no one answer to how does it take to replace a roof but actually a few. I’ll go over the details in this article. If you’re considering getting a new roof on your home the very first thing we recommend is getting a free roof estimate from Livingston Roof Pros. During the free roof estimate we’ll be able to give you a time frame that is more definite so you can better plan for your roof replacement. Although most homes are commonly done quickly here are some factors that will determine just how long it will take to complete your roofing project. As you can see the time frame allotted for a new roof installation in Livingston Michigan can vary because of these factors. Since all of these factors can determine how long does it take to replace a roof I’ll go over each in more details below. Here at Livingston Roof Pros we can install a variety of different roofing materials. The most common in Livingston Michigan is the asphalt shingle roof. However, even if you choose to use asphalt shingles on your home’s roof there still may be delays caused by this. One reason so many home owners face a delay with their roof replacement is the style and color of the asphalt shingles used. While there are many styles and colors that are available everyday there are also hundreds that are special order products. Choosing a special order roofing material means you’ll need to wait until it comes in to start the roofing project. Small homes that are less than 1200 square feet are usually done in a single day. However, for larger homes that have more ridges and valleys the time can go up. Although, barring any other problem, most home less than 4,000 square feet can be done in three days or less. Be sure you consider the other reasons on why it may take longer to install the roof as well. 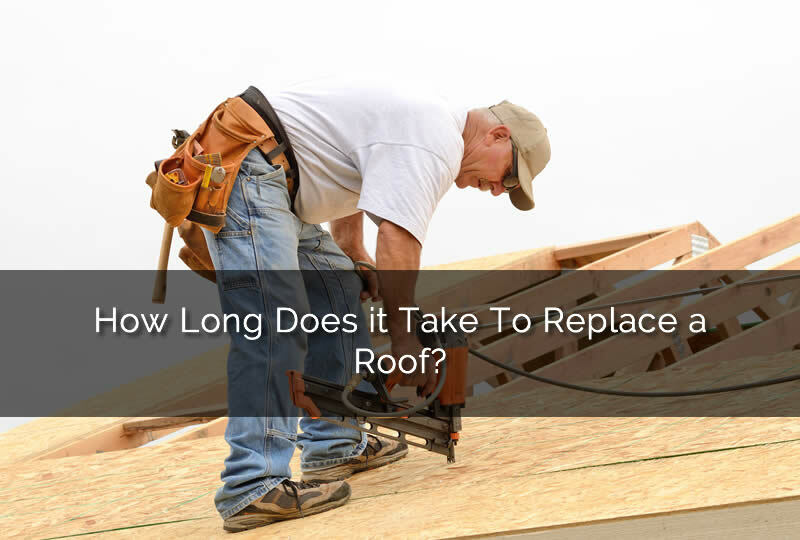 How Long Does it Take To Replace a Roof? Small homes that are less than 1200 square feet are usually done in a single day. There are two methods for replacing asphalt shingles on a home’s roof. The first method is called re-roofing. It’s done by placing the new layer of asphalt shingles directly over the old shingles. This can save time and money because the old shingles are not removed. If you choose to remove the old shingles it’s known as a tear off installation. At Livingston Roof Pros we can do either method of installing your new roof provided it has not been previously re-roofed. Although the roof decking is not a huge factor and only applies to a very small number of homes it’s certainly something that can affect how long it takes to install a new roof. Sometimes the roof decking can be damaged if previous leaks were bad and allowed to leak over a period of time. In this case the roof decking could be damaged and need replacing which may add an additional day to the project. If your home has a historical significance such as being a historical landmark then it may take much longer to complete the project. Because so much special care has to be given to historical buildings and homes it’s important that all permits and inspections are done accordingly. If your home is not a historical landmark this will not affect your roof replacement. Are you ready to get started on your roof replacement? To know more about the price of a new roof as well as other details including how long does it take to replace a roof be sure to contact Livingston Roof Pros. We can provide a free roof estimate to help you know more.